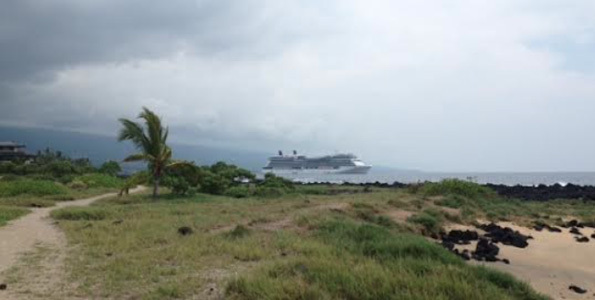 That big ship hanging out Thursday in Kailua Bay was the Celebrity Solstice. Next up for the ship is the Tahitian Treasures Cruise, a 17-night trek that starts Oct. 5 in Honolulu and ends in Sydney. The $750 million cruise ship is 1,041 feet long, has 19 decks and carries 2,850 passengers, plus 1,500 crew. According to the company website, the Celebrity Solstice is one of more decorated ships at sea and is full of “firsts.” Like the first Lawn Club at sea. The first Hot Glass Show. The first cruise line to have five women, also known as “the Leading Ladies” redesign, and redecorate the staterooms. The ship also boasts onboard amenities including a theater with a 1,400+ seating capacity, multiple restaurant dining options, The Patio on the Lawn, numerous bars and clubs, and youth facilities. Built in Germany and registered in Malta, the ship began cruising Nov. 23, 2008.